At one point during movie, monster get so enraged he charge into food court and start smashing, stomping, screaming, and trowing Sbarro pizza toppings at frightened children when – Oh, sorry. Dis not scene from movie The Hulk. Dis was Cookie Monster’s REACTION to movie The Hulk, one of de most tortuously long and plodding superhero movies me have reviewed so far. Ang Lee direkts dis film like a 70’s t.v. show, wit so many cheezy wipes and split screens monster feel like he watching an old episode of Streets of San Francisco. Lame dialogue not do much to dispel dis illusion. Only moments it not look like a 70’s t.v. show be during extended CG/visual effects sekwences – when it look like a lame videogame. 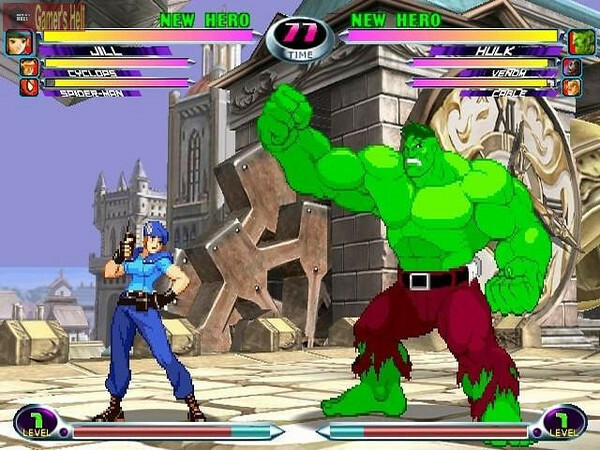 A scene from Hulk videogame movie videogame movie…uh…videogame. So, direkton, skript, and CG be crap. What else you got? How about: contrived story, stoopid developments, and one giant useless subplot involving skeevy-looking Nick Nolte (playing skeevy-looking father of Hulk) and his dogs. Sorry. 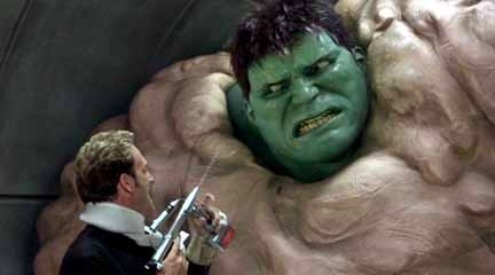 Dis be a scene from The Hulk movie videogame movie videogame…movie. Me tink. Movie begin in what look like (appropriately enuf) de 70’s where scientist David Banner (wit cheezy pornstar mustache) do sekret experiments on his son, Bruce. Years later, Bruce grown up and he too is scientist, working wit his hot ex-girlfriend fellow scientist, Betty. Sorry. 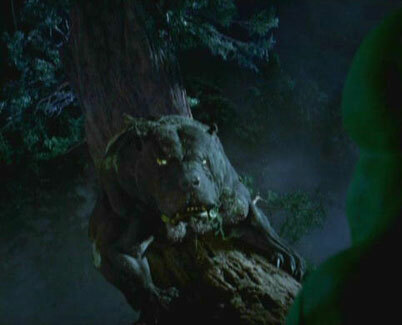 Me can accept sekret experiment dat turn human into raging green monster. Me can even accept fakt dat Bruce Banner’s stretchy shirts and socks rip off when he changes into Hulk while non-stretchy pants do not. 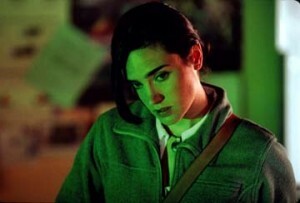 But me have have major problem accepting a nerd like Bruce Banner have hot ex-girlfriend dat look like Jennifer Connelly. A magikal world where humans turn into giant green monsters, electricity makes people stronger, and hot girls go out wit nerds. Another bizarre moment come when Bruce moping over Betty. He pull out photo of dem together and, suddenly, photo come alive and become window into flashback. In flashback, Betty tell Bruce about someting dat happened to her when she was young – at which point we go into another flashback. A flashback INSIDE a flashback. What de Fudgee-o? Next day, back in de real world, experiment go awry and Bruce blasted wit nano-mats(?). But he bounce back and in fine shape. In fact, even better shape dan before. It turn out dat nano-metes PLUS experiments dat his father subjected him to changed Bruce. He turn into Hulk and trash lab in scene reminiscent of de most mediocre of video game sekwences. Hulk furious. Me know how he feel after sitting thru dis dud of a movie. 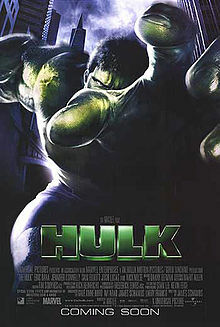 Despite being incredibly destruktive, Hulk never kill anyone in dis sopomorik movie. At one point, he cause helicopter to crash. Seconds later, pilot radio everyone be a-okay. It like, suddenly, me watching de A-Team t.v. series! But den, a couple of scenes later, me suddenly watching a low-rent Pixar knock-off when Hulk attacked by mutant dogs (led by hilariously creepy gamma poodle). Hoo boy. And dis movie not even close to over. Creepy janitor somehow gets access to trashed lab’s top sekret contents. How? Becuz he works dere. How did he get job? Well, me assume he passed de rigorous screening process. Well, as rigorous a screening process as possible considering de guy travels to and from work wit a pack of dogs. 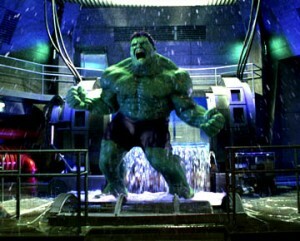 Bruce put in containment chamber and transforms into hulk. Containment container is breached. How? Does Hulk use his super strength to break it? No. It spring a leak. It breached by water displacement! Wait. Monster take back de fakt dat nobody die in dis movie. Somebody does die – de stereotypikal businessman – who killed (for reazon me still not understand) and blown up in ridikulous shot dat have him flying thru de air and den freeze before shot consumed by fire. General Thunderbolt Ross order all out attack on Hulk. 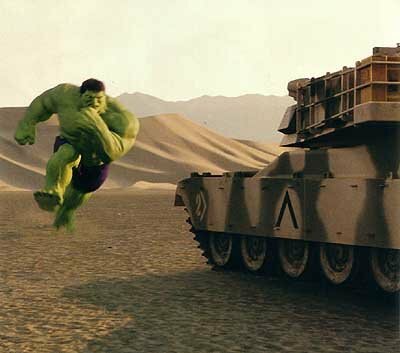 Hulk smashing tanks. Army shooting at Hulk. It look like it going to be one messy massive climactic battle – until General notice Hulk making googoo eyes at Betty. So he order his troops to stand down and send his daughter to confront crazy monster alone. Confronted wit Betty, Bruce lose his raging Hulk-on. No, wait! 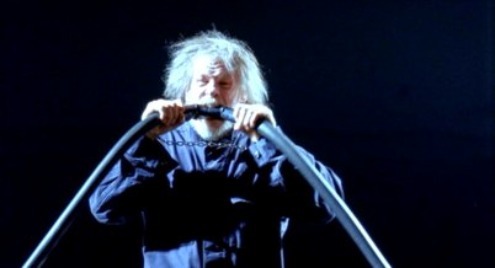 Me forgot about useless subplot involving creepy janitor who turn out to be Bruce’s crazy scientist father who used equipment leftover from lab thrashing to transform himself into mutant absorbing man. And so, audience have to sit thru interminable tacked-on extra half hour ending in which Bruce Hulk battle Father mutant in darkly lit sekwence where impossible to figure out what de hell be going on. Seriously! Your movie be 138 minutes long! Why dis subplot at all necessary? Lose 20 minute sekwence of father experimenting on Bruce off de top, lose creepy janitor, lose goofy gamma dogs, lose useless second ending and just have accident in lab be cause of Hulk. And voila. Instead of unbearable two and a half hour movie you let wit somewhat less irritating film dat run a more or less watchable 90 minutes! But Cookie Monster not writer/producer, so what me know? Verdikt: If dis movie was a frat house, it be Pi Krappa Gamma. Rating: 2 out of 10 chocolate chippee cookies.